AUBURNDALE – The Stratford wrestling team is heading back to Madison for the fourth year in a row after edging Coleman 33-27 in the championship dual at the WIAA Division 3 team sectional on Wednesday at Auburndale High School. 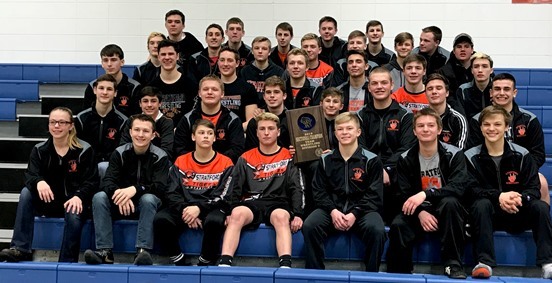 The Tigers, the two-time defending Division 3 state team champions, whooped Crandon 60-21 in the semifinals to set up another sectional final dual with Coleman, and it was tight. Coleman reached the final with a 54-24 win over Weyauwega-Fremont. Stratford trailed 14-9 after six matches before Trevor Dennee (195 pounds) and Trevor Steiner (220) won by pin to put the Tigers in front 21-14. Coleman responded with two wins to tie the match. Brock Martinson handed Stratford’s Dylan Schoenherr (40-2) just his second loss of the season, 5-3, at 285 pounds, and Chance Gruber won a major decision at 106 to even the match at 21-21. Gavin Drexler pushed his record to 43-0 with a 9-6 win at 113 and Manny Drexler improved 40-3 with an 8-2 win at 120 to clinch the match for the Tigers as they knew Max Schwabe had a forfeit victory waiting for him at 132. Caleb Gross won by pin at 126 for Coleman to even the match again at 27-27, but the Schwabe forfeit pushed Stratford to the victory. Stratford had three pins and won seven matches by forfeit in the win over Crandon. Gavin Kirsch (132), Ty Pankratz (182) and Logan Peterson (285) won by pin for the Tigers. Stratford will compete at the 2019 WIAA State Team Wrestling Tournament at the University of Wisconsin Fieldhouse in Madison on Saturday, March 2. Semifinal matches will be at 10 a.m., with the finals at 3 p.m. Seedings for the tournament will be announced at the WIAA State Individual Wrestling Tournament on Feb. 23. 132: Gavin Kirsch (ST) pinned Carter Bissonette, 1:48. 138: Bradley Shephard (CR) pinned Erik Schulte, 3:54. 145: Mavrick Licciardi (ST) won by forfeit. 152: Derek Marten (ST) won by forfeit. 160: Devin Dennee (ST) won by forfeit. 170: Breed Shepard, Jr., (CR) pinned Dayne Singer, 1:20. 182: Ty Pankratz (ST) pinned Keyan Colburn, 1:14. 195: Trevor Steiner (ST) won by forfeit. 220: Cole Marten (ST) won by forfeit. 285: Logan Peterson (ST) pinned Nick Adamski, 1:37. 106: Hutson Kane (CR) def. Logan Gaulke, 11-9. 113: Gavin Drexler (ST) won by forfeit. 120: Manny Drexler (ST) won by forfeit. 126: Jakob Hoyt (CR) pinned Benno Wenzel, 0:28. 138: Jacob Heiden (ST) def. Karson Casper, 5-4. 145: Jake Baldwin (COL) def. Mavrick Licciardi, 7-2. 152: Bryce Karban (COL) def. Devin Dennee, 2-1. 160: Derek Marten (ST) pinned Dakota Birr, 1:34. 170: Tyler Blanchard (COL) def. Hunter Ford, 4-1. 182: Shamus McLain (COL) won by technical fall over Jediah Knetter, 16-0. 195: Trevor Dennee (ST) pinned Johnny Bieber, 1:56. 220: Trevor Steiner (ST) pinned Spencer Karban, 3:46. 285: Brock Martinson (COL) def. Dylan Schoenherr, 5-3. 106: Chance Gruber (COL) won by major dec. over Logan Gaulke, 12-3. 113: Gavin Drexler (ST) def. Kotin Grzybowski, 9-6. 120: Manny Drexler (ST) def. Kasey Casper, 7-2. 126: Caleb Gross (COL) pinned Dillon Kirsch, 1:35. 132: Max Schwabe (ST) won by forfeit.